The Mayor of Mid and East Antrim Borough Councillor Lindsay Millar proudly announces the Mayor’s Charity Ball in aid of The Mayor’s chosen charity 2018/19: The Air Ambulance Northern Ireland. 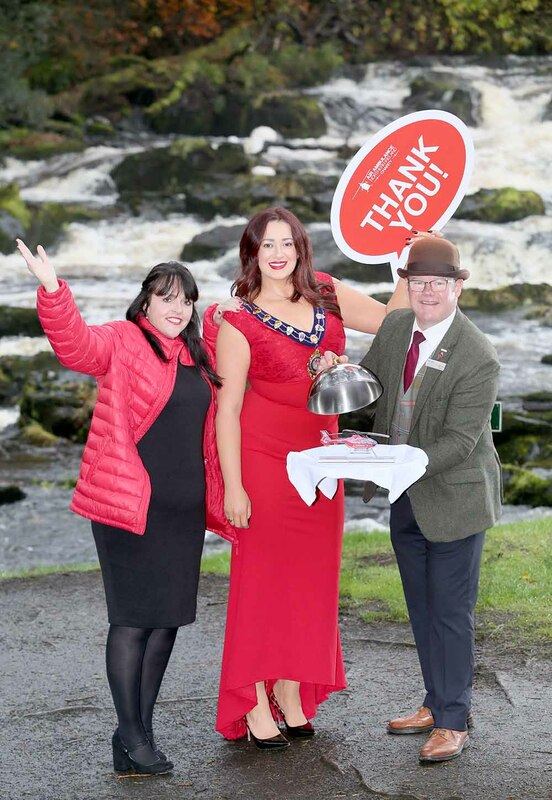 The black tie event will be held in the spectacular surroundings of the Great Hall at Galgorm Resort and Spa and will aim to raise as much funds as possible for the Mayor’s Charity. Highlights of the evening include red carpet and drinks on arrival, a sit-down four-course dining menu featuring local produce, and a live band. The entertainment will also include an auction and a ballot to which businesses, organisations and individuals are invited to donate prizes to help raise money on the night. Tickets can be booked in person, by post, by telephone and now online. Please note there is a 10% additional charge for online bookings. The Box Office is open Monday to Friday from 9am to 10pm and Saturday from 9am to 4pm. By post: The appropriate remittance and a stamped addressed envelope must accompany all postal bookings. Please write your name, address and telephone number on the reverse of your cheque and quote Mayor’s Charity Ball. Cheques should be made payable to Mid and East Antrim Borough Council. A small charge may be applied for credit card sales.